Magento Marketplace Advanced Commission: With the help of this module, Admin can set commission for products, categories and seller categories. Admin can use commission rule also. If any product lies under various categories on which admin has set the commission, then in this case the highest commission will be applicable on the product. Marketplace Advanced Commission For Magento2 is also available. Magento Marketplace Advanced Commission: With the help of this module, Admin can set commission for products, categories and seller categories. Admin can use commission rule also. If any product lies under various categories on which admin has set the commission, then in this case the highest commission will be applicable on the product. 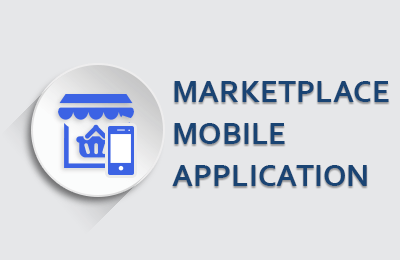 Default Magento Marketplace provides base commission feature to the admin. This add-on sets up the commission on the product and seller's categories. The admin can set the commission per product from the back-end. Admin can add “commission per product” on any existing product or on new product. If commission on product is not set then commission on the seller category will get priority if both are not set then default commission will be used. 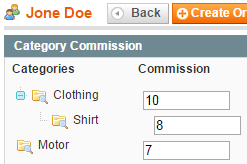 In Magento Marketplace Advanced Commission the admin can put the commission on seller's category. The admin can put different commission rate on different seller's category from the back-end. Using this module admin can create Commission Rule. By selecting ”yes” option from the back-end, commission will be charged based on the rules, which admin can manage from the back-end. Admin has to enter the price range, amount, commission type for commission rule. 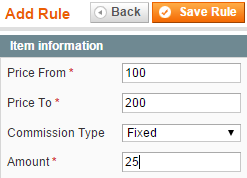 The admin can also use commission rule or can set two type of commission like- fixed or percent. Did you buy Magento Marketplace Advanced Commission? + Admin can set commission on products, the categories. + Admin can set two type of commission fixed or per cent’. + Commission on a product will get higher priority.